When our heroes explore the remains of an old and long since abandoned craft they may discover to their shock and surprise, as the light of their lamps fall upon the members of the craft's crew, that they are still dutifully manning their stations as skeletons or mummified corpses. It may be the wreck of a sunken ship on the ocean bottom, a Japanese WWII submarine stranded on a lone island, a derelict drifting through the endless night of outer space, a small plane caught high above the ground in the trees of the jungle or may take many other forms. It will often be a military craft of some sort or other. This means that the crew will be clad in the recognizable remains of their uniforms. Pilots will still be strapped in their seats. The helmsman will still be at the wheel. The Captain will be at the center of The Bridge sitting in the captain's chair surrounded by his Bridge Bunnies as he was in life. Often he will be wearing a captain's hat and some spider webs for decorations. When the heroes approach them from behind the life like poses, durable uniforms, and the back of the captain's chair can create the short-lived illusion that the crew is actually still alive before the ghastly truth is revealed. Recoiling in horror from that revelation, a clumsy hero might end up knocking over another crewman, who collapses from a life-like pose to a pile on the ground. IN SPACE! with everyone wearing spacesuits the illusion can be especially vivid with only the skull inside the helmet giving it away. The important distinction that defines and separates it from just finding a craft with some human remains in it is the fact that the dead crew is mostly found in the same places and poses that the would have been in life, showing few if any signs of having panicked or fought their fate. Either that, or they died too quickly to react. It is also important to note that the crew in those cases is most definitely dead and not just mostly dead or undead. In the latter case, it's Dem Bones. If the reveal provides a Jump Scare, see also Peek-a-Boo Corpse. If you're looking for the more figurative meaning of the term, that's under Crew of One or Critical Staffing Shortage. Mobile Suit Zeta Gundam has a scene where Kamille Bidan and Quattro Bajeena toured recently-defected from the Titans Emma Sheen to an abandoned colony, which apparently the Titans gassed and was abandoned to disrepair. We are treated to a very nice scene of dessicated human bodies left in their positions, being dried out (even dismantled) by the vacuum of space. Serenity: The bodies of the citizens/Pax test subjects on Miranda would technically count, since they pretty much just stopped everything they were doing, and lay down and died. The discovery seriously damaged Jayne's calm, and it's not hard to see why. The fossilized pilot in the first Alien movie, aka the "Space Jockey". The "B-17" segment in the Heavy Metal movie, before they were revealed to be zombies. The crashed drug-smuggling plane in the Colombian jungle in Romancing the Stone has the mummified corpses of two pilots still in their seats. Jack and Joan find refuge from the rain in the fuselage and raid the pilots' personal belongings for food and drink. Averted in Sunshine when Capa finds the crew of the Icarus I, huddled together but burned to a crisp in the observation room. Not on board a vessel of any kind, but the dead man in the Norwegian camp in The Thing (1982) arguably counts. The dead guy in the partially sunken boat in Jaws. The pirate ship in The Goonies is filled with skeletons of the former crew. Evoked with the title curse of the Black Pearl in Pirates of the Caribbean: The Curse of the Black Pearl. James and the Giant Peach: "A skellington! Jackpot!" Jurassic Park: Arnold's arm in the power station. Nedry's skeleton also appears often in derived media and fanart, still strapped to his car. The Lost World: Jurassic Park: The Big-Lipped Alligator Moment of the S.S. Venture arriving in San Diego with its crew in different states of crushing and dismemberment (in the script, this was supposed to be the work of raptors sneaking into the ship, but the explanation was cut out). Jurassic Park III: The skeleton found hanging from a parachute on a tree. This is explained in the novelization as the result of him being stabbed by a branch on the fall. Gimli's discovery of his kin's demise in the Mines of Moria in Lord of the Rings. He even gets a tear-jerker reaction. The city under the lake in Bridge of Birds. In the climax of the Discworld book Thud!, the well-preserved remains of the ancient troll king and dwarf king are found in this way, playing a friendly game of Thud as they awaited death, proving that they came to Koom Valley not to wage war, but to broker peace. In the prologue for Going Postal, it's mentioned that sunken ships with skeletons of crewmen stuck in the rigging or lashed to the wheel are found drifting on currents in the deepest parts of the ocean. In the Myst novel The Book of Atrus, the main character encounters remains throughout the fallen city of D'ni, most notably a group of skeletons found chained to a table for unexplained reasons. In Dracula, the ship that transports the Count to Whitby runs into the docks with its crew missing and the captain's decomposed body lashed to the wheel by his hands, while holding a crucifix. The Animorphs wander into a whole collection of ships with skeleton crews when they find the Nartec city and its macabre museum. The Ghost Ship in the sequel to the children's book The Castle in the Attic is manned by one of these. It also houses...other things. The Space: 1999 episode "The Testament of Arkadia" had a cave with skeletons seated around a table. "The Immunity Syndrome" plays straight the 'turn the captain's chair round to reveal the corpse' trope. "The Omega Glory". The crew of the starship Exeter was completely dehydrated and reduced to powder. Several of the bridge crew's uniforms are still seated in or sprawled over their duty stations. "The Naked Time". The body of the station engineer was found seated at a desk wearing protective clothing. Played with in the first episode of Red Dwarf, in which Dave finds that everybody in the crew is dead and turned to small piles of white powder...which are mostly still at their duty stations. Also done with actual skeletons in the episodes "Kryten" and "DNA". In Doctor Who episodes "Silence in the Library" and "Forest of the Dead", the Vashta Nerada leave the skeletons of the people they've eaten. In the animated short series "The Infinite Quest", similar skeletons actually crew a pirate ship. "Asylum of the Daleks" also showed the crew of the crashed spaceship this way...at first. Westworld: After the hosts rebel, they kill a maintenance group and prop their bodies against a vehicle to lure in guests. The National Lampoon had a Bruce Mc Call-created brochure for The Hindenburg, illustrated with scenes of travel on the airship, with the entire crew depicted as skeletons. The front cover of Blue Öyster Cult's album Secret Treaties shows the band members posing next to an Me-262 jet fighter bearing the band's logo. The pilot has a distinctly under-nourished or perhaps terminally anorexic look. Basic Dungeons & Dragons module X2 Castle Amber. One room had skeletons standing around: they were frozen in place by the magical effect that killed them. A crew of flaming spirits and skeletons man the Ghost Ship of Dragon Quest III, along with the odd demon and monster. This is largely played for tragedy, as these lost souls are trapped on board for eternity... save for one whom you can free by taking a trinket back to the ghost of his lost love, allowing them to reunite and move on. The ruins, marketplace, and courtyards in Aporia: Beyond the Valley are full of intact skeletons in various poses. Some appear to have carried on normal daily activities - eating dinner, manning market stalls, tending plants - right up to their last moment, while others clutch equally-skeletal children in their arms or lie, still clutching pickaxes and hammers, in front of the sealed doorways to shelters that they'd tried (and failed) to penetrate. The animated shorts Fortress and Last Day of War features pilots and operators still in their suits, seated in bombers and fighters yet completely desiccated. The machines continue the war. Played for laughs in Madagascar. When Alex asks the lemurs where the people are, they point to the skeleton of a parachutist hanging from a tree. Later we see the lemurs gathering in the wreck of a plane, with some skeletons still in their seats. Looney Tunes: The Beans short "The Phantom Ship." The Simpsons Treehouse of Horror story, "The HΩmega Man", has Homer walk into a bomb shelter where the town gets nuked while he is inside. He walks out to town where everyone has been skeletonized and still in their living poses, but being the idiot he is he doesn't realize everyone is dead until much later. He spends the early part of the episode casually interacting with several skeletons, causing them to break apart. It isn't until he sees a newspaper saying a bomb was headed towards the town does he realize the truth. The Venture Bros. - Brock and Dean investigate the wreckage of a plane that crashed in the compound, and Dean spots the charred bones in the cockpit. Dean: Brock! 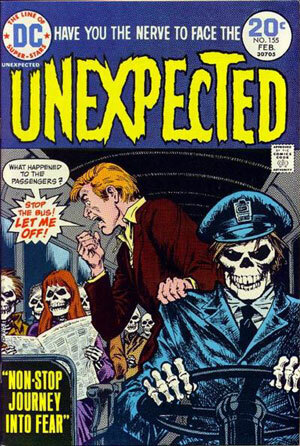 I think I figured out why the plane crashed - there were skeletons driving it! I don't think he is a vegetarian. Pompeii and Herculaneum, except most "skeletons" are in realistic panicking and/or cowering positions. Said "skeletons" are just empty spots in hardened volcanic ash. The bodies themselves have crumbled into dust centuries ago. The "shadows" of people burned on the walls of buildings in Hiroshima after the dropping of the first atomic bomb might be a good Atomic-Age version of this trope. The crew of the H.L. Hunley fit this trope she sank for the third and last time. Warren Lasch (chairman of the Friends of the Hunley organization) commented,"We half-expected them to be piled up under the hatches trying to get out, but there they were, still at their stations." Helios Airways 522 suffered a cabin depressurization that killed everyone onboard about 20 minutes after takeoff. The plane continued flying on autopilot until it run out of fuel and crashed, three hours later. Adrift sailing boats with skeletons show up on the Japanese coast sometimes. They are believed to be North Korean ships that tried to defect to Japan or - most likely - ships that strayed further than they should, due to North Korean waters being depleted from overfishing, and couldn't make the trip back. In 1968, the Spanish fishing ship Fausto was found adrift on the Atlantic Ocean with a mummified body in the engine room. It had gone missing two months earlier while covering a short route in the Canary Islands.